Nanluoguxiang authorities say they want more entertainment companies on the famous street. 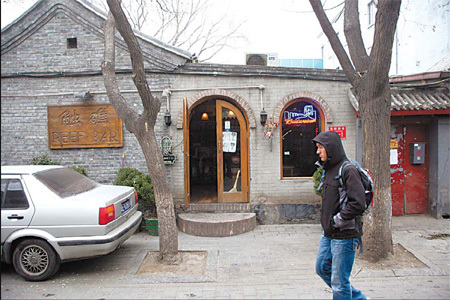 The managers of Nanluoguxiang, one of Beijing’s most popular streets with a 742-year history, plan to restrict the number of bars and cafes in the popular tourist precinct. Yu Yongjun, vice-director of the municipal government’s Jiaodaokou office in charge of the street, said it wants to work with rich entertainment companies to turn the street in an area promoting popular culture. “All businesses in Nanluoguxiang contribute a total of no more than 500,000 yuan in tax every year,” Yu said. “We will use a total of 13 million yuan to develop the quality and diversity of culture represented by the street by 2011,” he said. The street is a popular destination for Chinese and foreign visitors for its local flavor and traditional Beijing architecture. Many artist and performers are also drawn to the area because of its proximity to creative institutions, such as the Central Academy of Drama. Yu said the street once housed construction businesses, and that printing stores, restaurants and pubs opened from 2006 onwards. However, Nanluoguxiang store owners were concerned about the changes. “The rent for a 30-sq-m shop was 1,000 yuan per month back in 2005, but now I have to pay more than 10,000 yuan. The rent has been raised by 10 times, which makes my business tougher,” said Yin Qi, owner of Chinese painting shop Color Together. In addition, Yin was concerned about the taste of new customers and the future of his store if local authority used the street to promote popular culture. “There are more visitors coming to my shop now, but fewer of them can understand my products than before. The increase of customers doesn’t bring in any new buyers,” he said. Customers were also concerned that further development would cost them more money and that the street would lose its local charm. “I have seen it become more commercialized since I started hanging out with friends here about five years ago,” Yoewi, a 25-year-old visitor from Holland said. This entry was posted in Chinese Culture and tagged Beijing, culture, Nanluguxiang. Bookmark the permalink.